► Which one is best to drive? From old Velar, the concept that turned into a production car, to new Velar, the production car that looks like a concept. From dual-purpose 4x4 aimed at country folk, to road-biased SUV bought by everyone (but mostly townies). From functional to fashionable, from the shires to Shanghai. The evolution of Range Rover, the brand, mirrors that of SUVs, the breed. The first 1970 Range Rover – prototypes of which were badged Velar – was also the first modern SUV. It was equally good on the bridleways and the motorways. There were some earlier big American 4x4s also designed for on-road and off. Except they weren't very good at either. That first Range Rover was a big, bluff, handsome, versatile beast. Chief engineer Spen King certainly did not consider it a luxury car or in any way 'premium' – favoured cliché of today's motoring marketers. Yet it evolved into one. Soon, Range Rovers became go-anywhere substitutes for executive cars. The SUV was born. Rivals copied. The rest is history. And, in some cases, tragedy. The SUV is now the fastest growing breed of car in the world. As they morph from oddity to ubiquity, so their ownership base broadens. They now appeal to everyone from virile driver to nervy motorist, from family man to shielding mum. Those of macho disposition like their daunting size. Those of personal insecurity like their protective bulk. Perhaps saddest of all, they are even becoming sports car substitutes, especially in impressionable new markets such as Russia and China. There a young man's fancy is more likely to focus on a big-foot SUV than a wide-tyre sportster. They lust after a twin-turbo Cayenne, not a flat-six 911. As the market booms, so the offerings fragment. They vary from toy-like Suzukis to tough Toyotas; from macho Mercs to musical Maseratis; from posh Porsches to big BMWs; from Q2 to Qashqai. We find bling Bentleys and giant Jaguars. The daddies of the genre, Jeep and Land Rover, expand and diversify. Rather like the inventor of the selfie stick, they probably can't quite believe what they've started. SUVs now come in all shapes and sizes, but two of the most special stand before me. The Porsche Macan GTS, in the same shade of red that adorns today's 911, is probably the sportiest SUV of all, if we exclude the closely related Macan Turbo. In many ways, it is more inflated hot hatch than speedy SUV, though Porsche refers to it as a sport utility vehicle. It's also tolerably spacious, reasonably versatile and comfortable. It's as much 4x4 family car as all-wheel-drive sports car. Then there is the new Range Rover Velar, Land Rover's most road-biased SUV and its most stylish car, too. In supercharged petrol 375bhp V6 form, as tested, it's also Land Rover's sportiest mid-range SUV, a handy quality as it tackles Porsche. 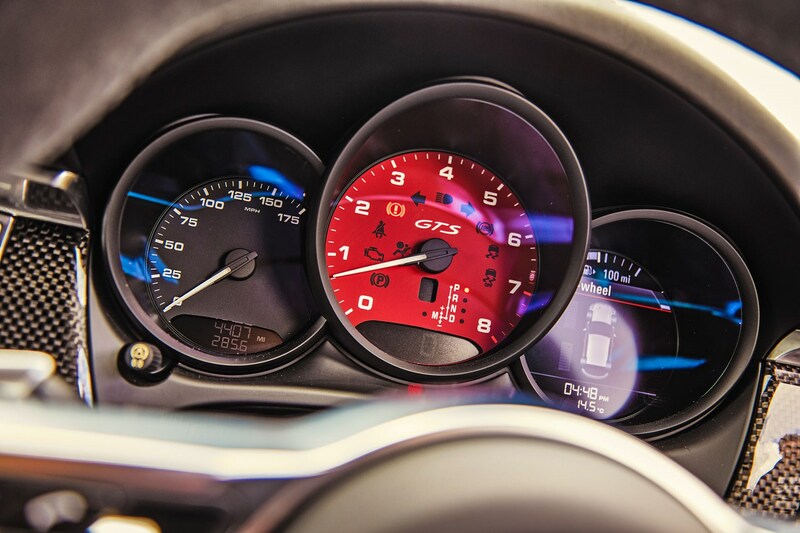 Top speed is 155mph and 0-62mph takes 5.7 seconds. It is a very imposing car, breathtakingly handsome from many angles. Design boss Gerry McGovern is probably the world's most respected stylist of SUVs, and here surely is his masterpiece. Gerry doesn't like anoraks, camping, sleeping bags, or any of that hardy old Ranulph Fiennes stuff. The Velar is no more likely to be used on global adventure than a pair of John Lobb bespoke Oxfords. This is very much a Gerry McGovern Range Rover, achingly urban, glamorous not gritty. The style is amazingly clean. Everything is flush, including the door handles. It's one big, smooth piece of sculpture. The stance – often a problem with slab-sided, high-roof SUVs – is4 perfect. It's big – much bigger than the Evoque, but smaller than the Range Rover Sport. It's also more than 100mm longer than a Macan, though of similar weight. Thank the Velar's aluminium architecture, a Jaguar Land Rover hallmark. The pop-out door handles glide forward when the car is unlocked, and gently retract again when the doors are shut. Inside, the design is just as uncluttered as the exterior, devoid of superfluity and needless decoration. Apart from a couple of multifunctional rotary controllers, all major controls are handled by two touchscreens. The lower screen is flush with the centre console, while the upper screen swivels forward when you take up station behind the wheel, and the alloy rotary controller rises gently from its nest. It's all part of the appealing theatre of Velar ownership. The twin screens provide a bewildering variety of functions, from the mundane (radio channel selection, ventilation control, phone, sat-nav) to the arcane (g-meter and stopwatch including 'best time' – presumably for that blast around the 'Ring). For maximum sportiness, there is a crash helmet icon that accesses a mode to allow personal configuration of your Velar's mechanicals, dialling up the sharpness of steering, throttle, gearshift and suspension. There is also Eco, Comfort, plus the usual Land Rover Terrain Response settings (sand, mud/ruts, grass/gravel/snow etc). Though primarily a road car, the Velar has significant off-road potential. It's the Land Rover brand's key differentiator, after all, from all the other SUV pretenders. We even find a Low Traction Launch Control setting, deep in the touchscreen's menu. 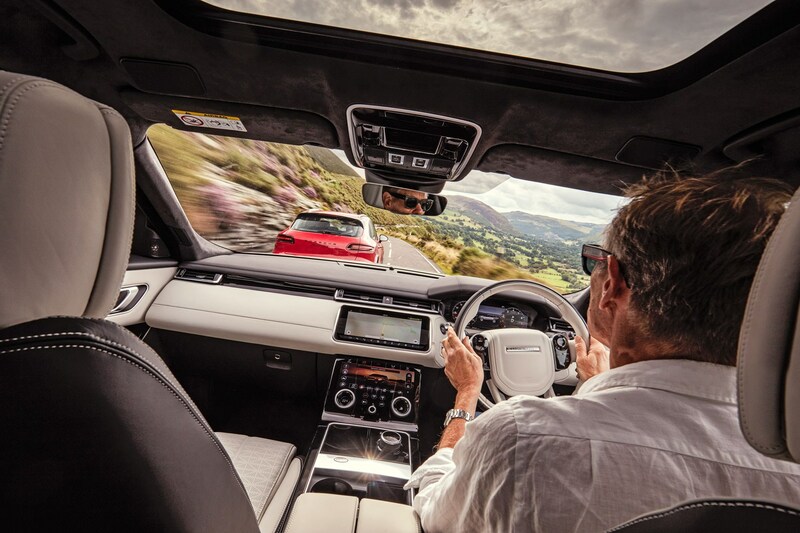 Mind you, the furthest most Velars are likely to venture off road is a sandy Norfolk car park by the sea, or a nicely manicured school sports field. Our car's air suspension permits height adjustment too, all the better to vault rocks and ruts. In front of the driver the electronic entertainment continues: a high-tech TFT looks pleasingly analogue. There's a head-up display as well, projecting key information onto the windscreen, in the driver's line of sight. Front-seat comfort is excellent, and rear room okay for three. The rear backrests are electrically rake adjustable on our First Edition test car, complete with every option imaginable, and a fanciful £86,175 price. Losing the First Edition spec but keeping the same supercharged petrol V6 doesn't trim the price much: you can get a Range Rover Sport with the same powertrain for less. The whole cabin works very well, with one caveat: the lower part of the cabin – seat foundations, floor trim, and door map pockets – are all made from hard, low-grade plastic, the sort you might expect in a £10k Dacia but not an £80k Rangie. We meet, for this twin test, in Telford, named after road and rail engineer Thomas Telford, the self-styled birthplace of the industrial revolution. 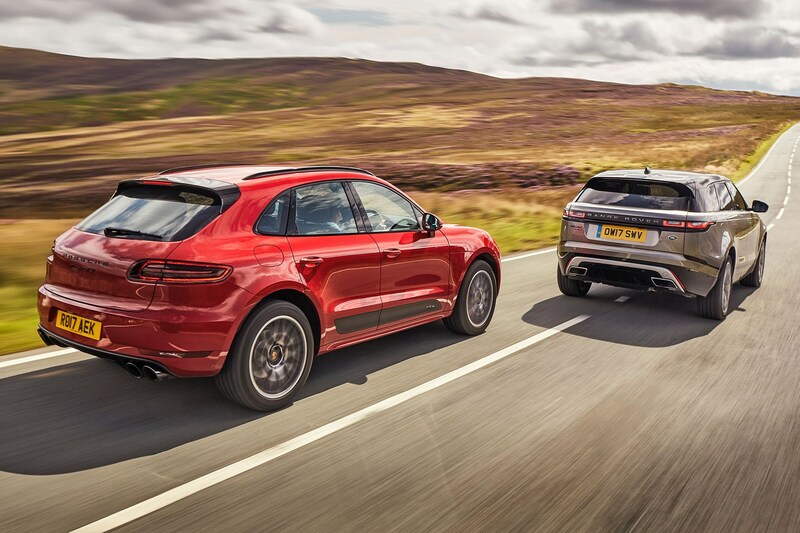 The Macan in its bright red paintjob is lower, shorter and narrower than the expansive Velar. Its body-work looks shrink-wrapped around its mechanicals, whereas the Velar is the extravagant voluptuary. 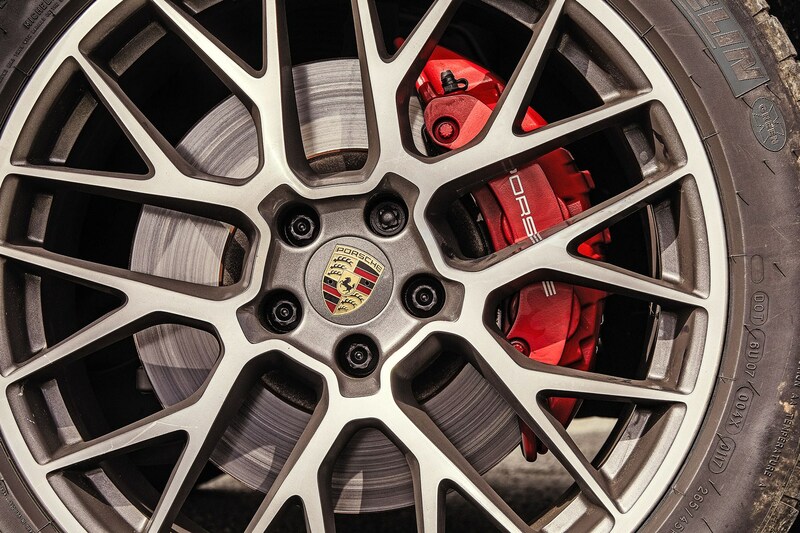 In the Porsche, you pay for what's beneath the skin. You buy a Velar for its skin. The Macan is not a handsome car, at least to my eyes, although it's nowhere near as bad as its big ugly sister, the Cayenne – endlessly updated, remorselessly repulsive. As with all Porsches, the stylists have tried to imbue the design spirit of the 911, from flowing front wings, to distinctive front and rear lamps, to rounded hips. You can certainly see the 911 overtures. Sadly, this language only works on a 911. 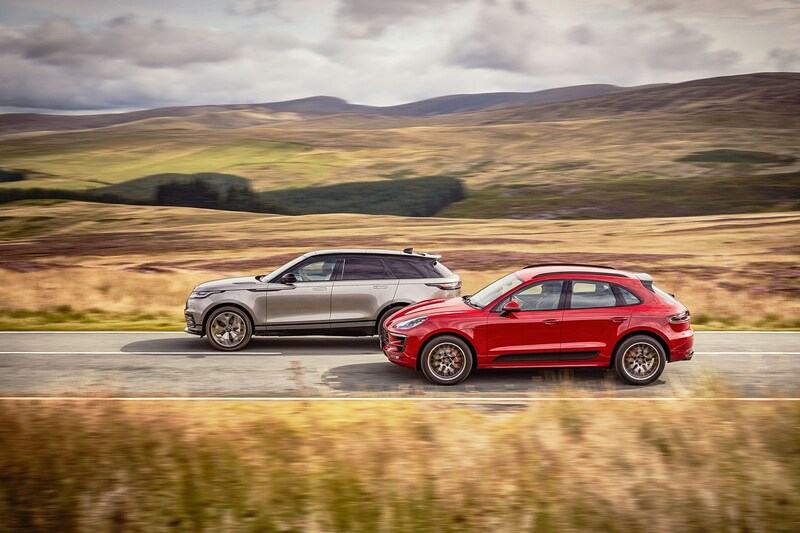 The Cayenne and (less so) the Macan look like 911s on stilts. The poor Panamera like an extended 911 that's spent too much time on a rack. Inside the time-honoured Porsche design cues work far more successfully. We find the big central tacho, red on our GTS. The instruments are analogue, naturally. There is a lovely little black Alcantara-rimmed steering wheel. Driving position is just so. The gearchange paddles feel like real metal (where the Velar's feel like thin plastic). abundance the touchscreen looks almost inconsequential. The graphics are poorer quality than the Velar's. 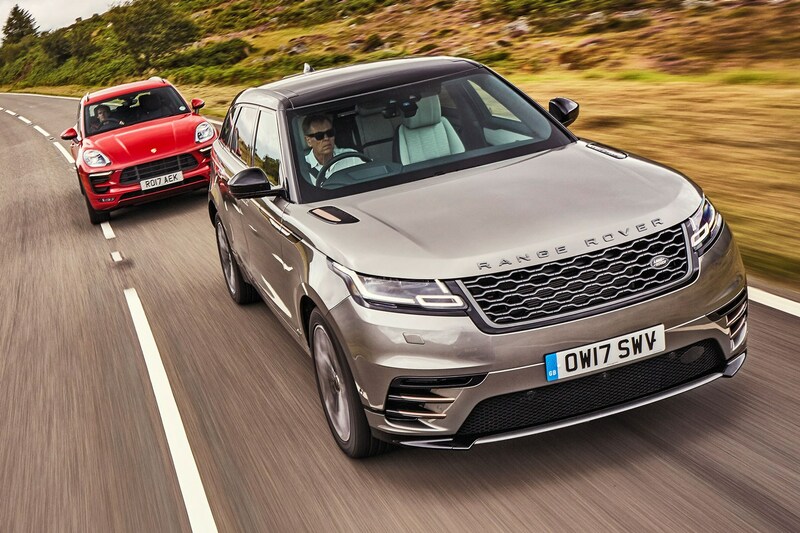 In connectivity4 and modern electro-gadgetry, the Range Rover is a generation ahead of the Porsche, and it's been a long time since we've been able to say that of a British car over a German one. 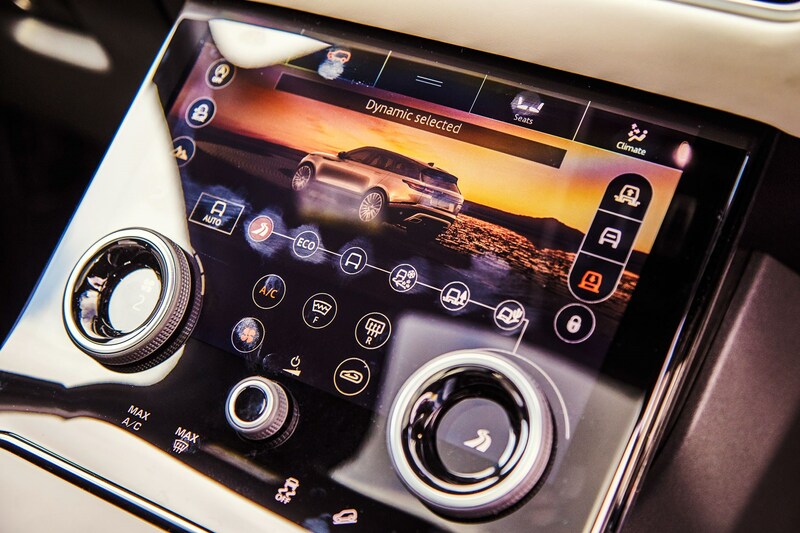 We've never been able to say it before about a Jaguar Land Rover product, long-time connectivity laggards. Heavens above, our Macan even came with a CD player. The Macan's seats hug and grip you. They are sports chairs, and they're not only comfortable but hugely supportive, especially at speed. Despite the 100mm or so difference in length, there isn't a big usable difference in rear-seat room. The Velar's back seat is more spacious, but not significantly so. Its boot, though, is much bigger. If you need loads of carrying space, buy the Velar. Both have handy 40:20:40 folding rear seats, good for versatile load lugging. So, the two cars meet in Telford. I've driven up from London in the Macan. Colleague CJ Hubbard has driven from Peterborough in the Velar. 'Fast, a bit anodyne to drive, looks spectacular,' is CJ's early, pithy and prophetic first impression. 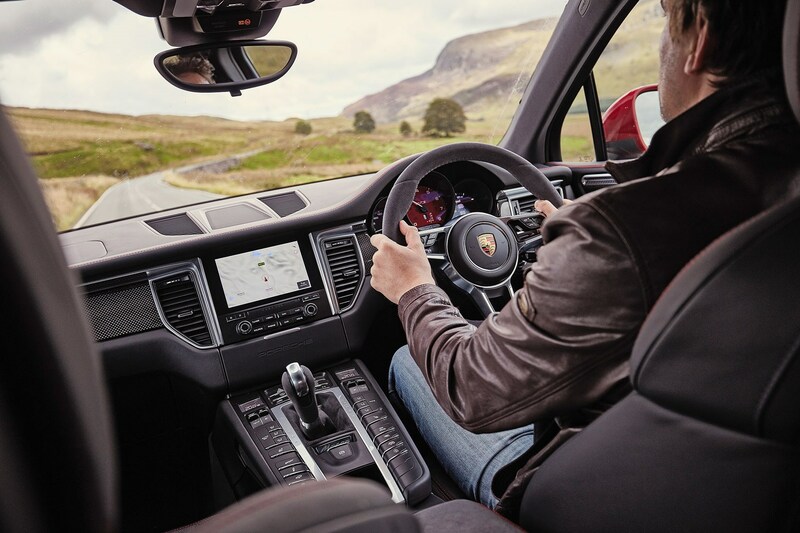 The Macan, conversely, can be so far summed as 'fast, engaging to drive, so-so to look at'. I keep driving the Macan to a fuel stop near the Welsh border, where we swap. From there we drive deep into Wales, mostly on winding secondaries to Snowdonia, through pretty villages and on to Bala, where we have lunch. Then it is deep into Snowdonia, including a winding B-road to Ffestiniog and Rhyd-y-sarn, familiar from previous drives on Welsh moorland roads in supercars. Only sheep and speed limits spoil the fun. We even have time for a brief spot of 4x4 off-roading on a narrow rutted grassy track (Velar 1, Macan 0). A full and hard day's driving – swapping from Macan to Velar and back – makes it clear that if driving enjoyment is your priority, then it's the Porsche's keys you want. The Macan is the best-driving SUV in the world, and by some margin. The GTS is an especially tasty iteration, 355bhp twin-turbo 3.0 petrol V6 meets seven-speed PDK gearbox. That may be 20bhp less than a Velar, and one ratio fewer, but you never feel short-changed. It accelerates faster and always feels more lively. An extra 30-odd lb ft of torque (369 vs 332) helps. 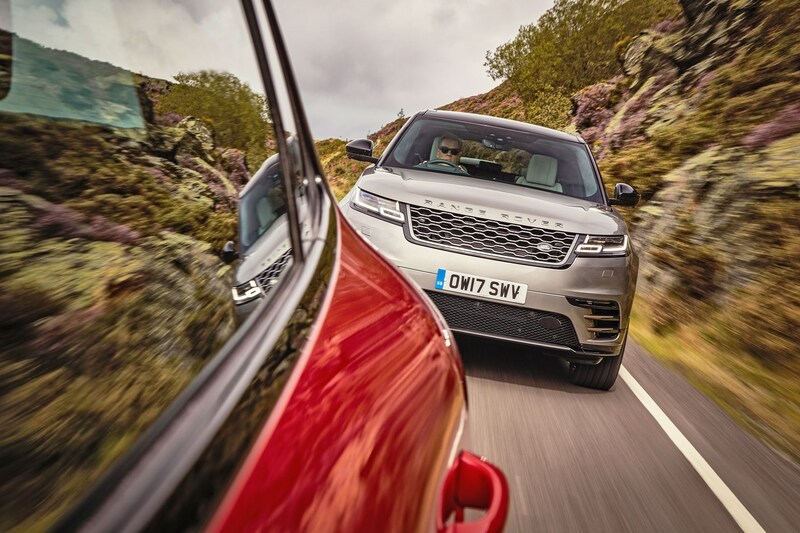 On the twisty stuff, the Macan hunkers down on its heels, while the Velar floats on its toes. The Macan is a more confident beast to push hard; better feedback, sweeter brakes, sharper paddleshifting, more responsive throttle, more feelsome steering. My God, it's almost 911 good, though you still feel you're riding too high. You want to be down close to the action, not up with your head in the clouds. It's like driving a 911 from the roof. The Velar, by comparison, just feels like an SUV – too high, too heavy, too soft, too floaty, a decent car betrayed by its proportions. All SUVs are too big and too heavy; this 'mid-sized SUV' weighs almost 1.9 tonnes. Nonetheless, choose Dynamic mode, switch the rotary controller to the Sport Manual setting, and you can have some fun on rural secondaries.4 That supercharged V6 is eager, tuneful (though not so melodious as the Porsche's V6), and at speed the suspension does a pretty good job of absorbing the bumps and yet providing clear feedback. It still feels like an SUV alongside a sportster, though. Even at lower speeds the Macan is the better drive. More communicative, sharper, as much track car as demi-truck. It rides better, too, on its 20-inch wheels. 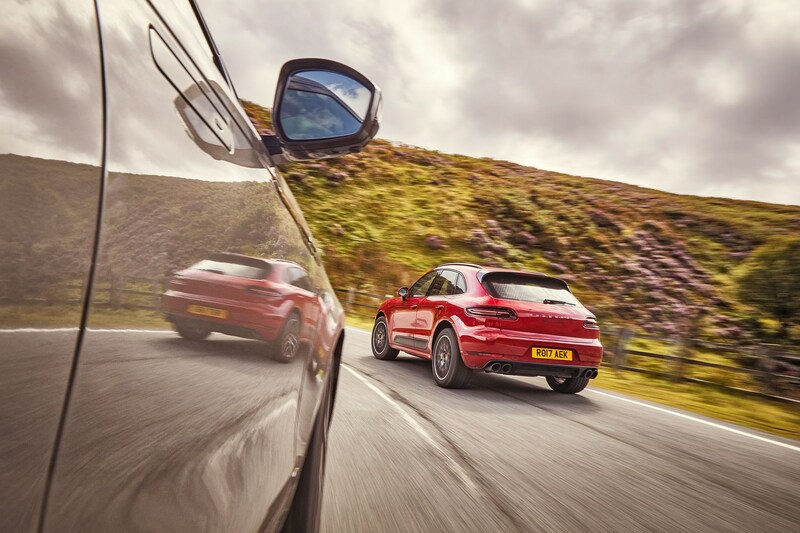 Even in Sport mode, the Macan has a lovely fluidity about the way it moves over the tarmac, suppleness meets sportiness. No SUV does it better. The Velar's ride disappoints. On air springs and 21-inch wheels the ride is a bit thumpy at low speed, and sometimes unsettled at bigger speeds (it actually improves when pushing hard). It lacks the driving fluency of a Range Rover or Range Rover Sport. It must be even worse on 22-inch wheels. If you choose a Velar, go for the smaller rubber, even if it does betray the concept-car-styling swagger. In driving appeal, it's a clear win for the Porsche. The Macan is also more comfortable, owing to its superior ride, and has a cabin of higher overall quality, if not design pizzazz. Where the Velar uses hard, cheap plastics on its lower flanks, the Macan uses soft-touch plastics of finer tactility and, I'd expect, durability. But should a Macan versus Velar contest be settled purely on dynamics, with the odd nod to plastics quality? Of course not! The Velar is the more striking to look at, the more special all-round ownership experience. It's an exquisitely executed piece of sculpture. It will get more covetous glances from neighbours and other drivers. So is it horses for courses? 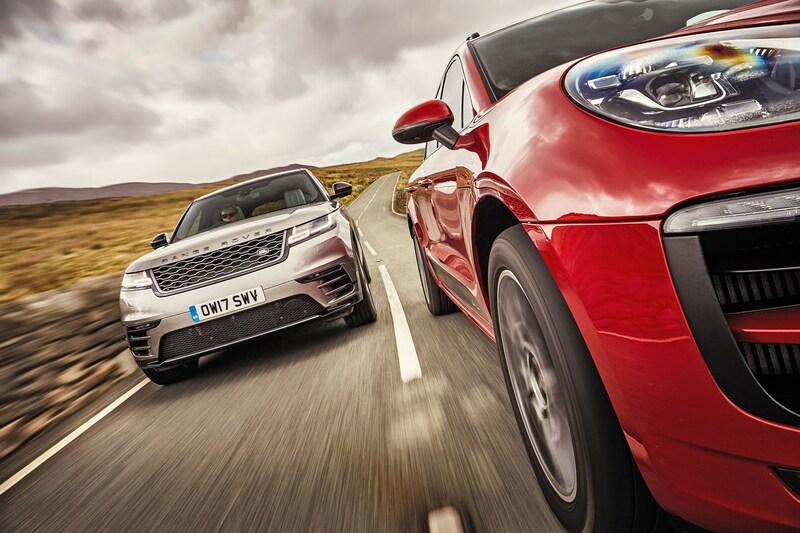 The Macan for keen drivers, the Velar for those who prioritise design and functionality? That might be the logical conclusion. Personally, though, I'd buy the Macan. Better to drive – fast or slow – and also better value as tested: £68,506 against a preposterous £86,175. If the Velar appeals – and I can see your point – then around £60k is the sweet spot. That gets you 2.0 turbo petrol power, probably all you need. It gets you all the concept-car drama, the start-her-up theatre, and the modish cabin. It gets you a car of astonishing style and significant substance. But for the same money you can still get a Macan GTS, complete with boisterous twin-turbo V6. And when the road opens, traffic thins and the corners arrive, you'll be glad you chose the Porsche.